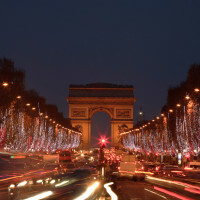 Champs Elysées once again shines in its unequalled Christmas lights and the largest Christmas market of the metropolis, located between the Ferris wheel of the Place de la Concorde and the Grand Palais, is open. For the sixth time, more than ten million visitors from all over the world are expected until 4 January 2015, which makes this Christmas market in the heart of the capital one of the most-visited events of its kind in Europe. International exhibitors present exclusive gastronomy and precious artistic crafts from their homelands in approx. 250 elegant white huts. Opened daily between 11:00-23:00, Friday and Saturday even until 24:00 continuously: “les Nocturnes”. And right in the midst of it is our Casa Millefiori – Artistic Candles & Light Show hut – which conjures up a small hint of German Christmas at one of the most famous Boulevards in Europe. Don’t miss this unforgettable Christmas experience among the festive sea of light of the metropolis. We are looking forward to your visit!